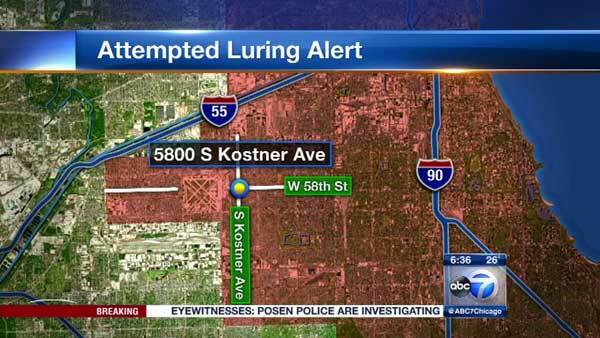 CHICAGO (WLS) -- A man tried to lure two girls into his vehicle in the 5800-block of South Kostner Avenue on Chicago's Southwest Side, police said. Authorities said a man in a black SUV, possibly a Jeep, asked the girls if they wanted a ride around 4 p.m. Saturday in the city's Elsdon neighborhood. They refused and ran away. He allegedly drove around the block and asked them again. The girls ran into a nearby business and called police. The suspect is described as a white or Hispanic man in his late 30s with black hair and a mustache. Police said he was wearing a royal blue shirt or sweatshirt. Anyone with information regarding this incident should contact Area Central detectives at (312) 747-8380.